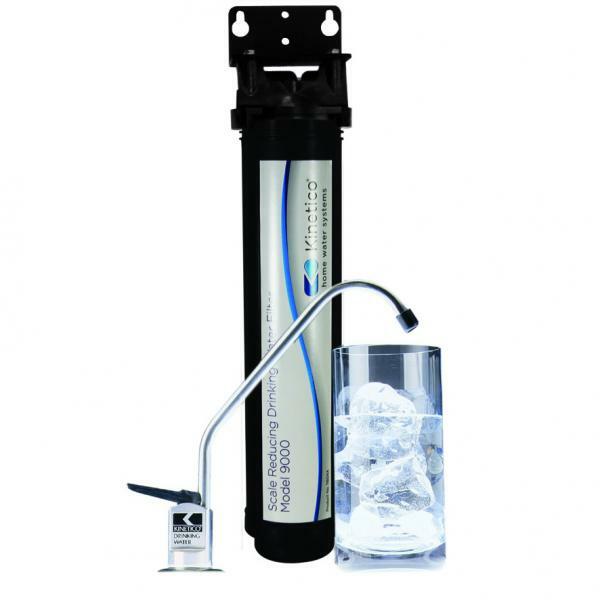 The Kinetico Model 9000 AquaScale Drinking Water Filter is easy to fit and comes with full instructions and everything you need to carry out the installation yourself, including the drinking water tap, hose, all push-fit connections and a saddle valve to tap into the mains water supply. You will need to drill a 15mm hole in your work surface or sink to mount the tap for convenient use. Mains tap water, although generally safe to drink does not always taste as good as it could. Chlorine, sediment and limescale (water hardness) affect the smell and taste of tap water but the Model 9000 AquaScale Drinking Water System removes all of this. You will need to change your Kinetico Model 9000/ Aquascale water filter cartridge when you notice the limescale returning to your kettle, and this is easily done with a quick twist off/twist on action. Most cartridges will last 3 to 7 months depending on use and level of local water hardness. • Easy to install and comes with full instructions, including everything you need to carry out the installation yourself. • Provides a constant 24 hour supply of fresh drinking water. • Capacity: Variable depending on hardness of the local water supply. • Removes unwanted chlorine, sediment and limescale (water hardness) from your drinking water. • A combination of weak acid resin and activated carbon is used to reduce the unwanted elements in your mains tap water. • The weak acid resin reduces the hardness ions, calcium and magnesium (the cause of lime scale), whilst the activated carbon reduces the chlorine and sediment content thus improving the taste and odour of your drinking water. • Quick disconnect (twist and remove), sanitary filter. • Save money and help the environment - never buy bottled water again. • No more inconvenient filter jugs which can be slow and costly for replacement cartridges.